Offering you a complete choice of products which include plate magnets. 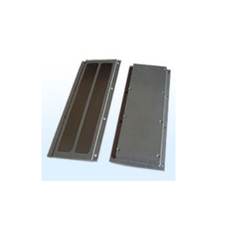 We have established ourselves as a renowned manufacturer and supplier of a broad array of Plate Magnets. The offered magnets are used for separation of fine ferrous materials and large pieces of tramp iron. Available in various specifications, these magnets are used in textiles, mineral, chemicals, plastics, cosmetics and pharmaceutical industries. Looking for Plate Magnets ?